The Customer provides marketplace and exchange software across all derivative markets, Futures and Options, Financial and Bi-lateral OTC. The software enables business customers to maximize the financial and operational benefits of electronic commerce. Market participants working on the client’s platform can manage orders themselves, or through the use of voice trading. The Customer’s business included a voice brokerage in the energy sector, where the contracts made over the voice trading service were settled by a physical delivery. While trading was done outside of an exchange, the block trades made in the system still needed to be registered with regulation authorities. Devexperts was approached to create a solution that would automate voice brokerage services to increase the number of brokers working with the Customer, scale the business by establishing an online terminal and make the Customer’s services available to a larger audience. Devexperts came up with a solution that became a natural ecosystem for traders, brokers, clearers and exchanges. 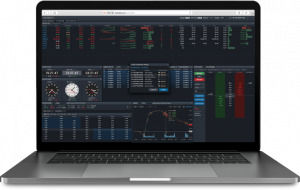 The developers took ready-made components of dxTrade OMS and the dxTrade Desktop trading terminal, and added a matching engine built from scratch. The trading and execution on the platform went via its proprietary order flow, matching engine and central limit order book (CLOB). The solution was a dark pool, that matched trades and submitted them to a clearing house. It supported day orders for commodity futures and options, custom structures, calendar spreads, multi-leg trading, as well as local and external markets. It could handle single and spread orders (with up to 40 legs) for CME and ICE futures and options instruments through the platform’s GUI application or an inbound FIX connection. The on-suite offerings included Energy Trade and Risk Management (ETRM) and workflow admin controls. The system was compliant with the specifics of the business model. It allowed for post trading management; self-clearing, external clearing, and different broker roles. The Customer could effortlessly configure new contracts, list new Bi-lateral products and add new clients. In addition, it offered anonymous transparent routing and order display for ICE, CME, LCH, NODAL, NASDAQ all clearers and the OTC Bi-Lateral Markets. The solution was launched in Canada for a broker focused on oil and natural gas futures trading for leading companies such as Shell, BP, Chevron, requiring a physical settlement of contracts. It was made available to up to 5000 users and supported hundreds of orders per day placed by high net worth individuals, suppliers and consumers of commodities. The order processing time was less than one sub-millisecond on average.